Looking for some relatively cheap, older-type PlayStation 3 games? Amazon's doing the PS3 deal day thing once again, kicking things off with a little Modern Warfare and seeing where things go from there. Judging from the clues and the games already on sale, Amazon seems to be trying to move games that everyone who owns a PlayStation 3 have already picked up by now, but if you are a new PS3 owner, then you might want to take a look. 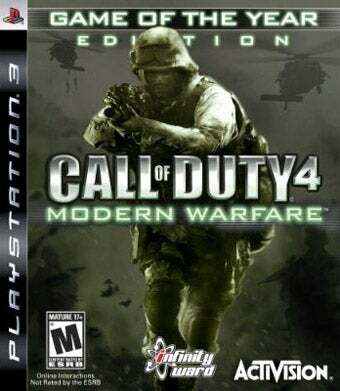 As per usual, they have one Deal of the Day, and that is Call of Duty 4: Modern Warfare, available all day long for $29.98, or 42% off of their normal price. Then they have the timed deals, which right now features a $40 copy of X-Men Origins: Wolverine, good for another couple of hours. It looks like that will be replaced by a game I am not able to decipher the clue for, with Guitar Hero: Metallica, Ratchet and Clank Future: Tools of Destruction possibly, and finally a chance to "Step into the ring with the Eighth Wonder of the World", whatever that may mean. Amazingly helpful, aren't I? You smart folks will probably have the clues figured out before I even post this. Feel free to lord your superior riddle-solving skills over me in the comments section.